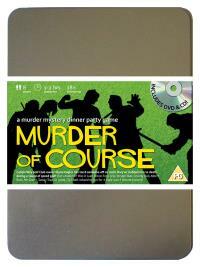 You've been invited to play the role of MO GREEN in Murder of Course. Glynn Eagles, owner of the prestigious Callow Way Golf Club, has just announced plans to build a new exclusive golf resort and is hosting a party to celebrate. However, during a round of golf before the party begins, Glynn is clubbed to death on the green of the 18th hole. Join us to find out who ended his round early! Groundskeeper (she loves to keep those bushes neatly trimmed!) Costume Suggestion : As groundskeeper you wear a green uniform to blend in with the scenery and to stop golfers at the club aiming at you. You always carry binoculars (for observing local nature of course!) and not wishing to be left out, you also wear gloves: gardening gloves, that is. You’re the groundskeeper at Callow Way. People think you’re strange because you live on a nudist colony, even though you keep telling them how great it is there. You know they’d love it if they could just see it for themselves but every time you invite a colleague over for dinner they seem to have a prior engagement.